If you want to increase the effectiveness of your ColdCure® treatments, attach an Accessory Strap to your Ankle, Elbow, Foot, Shoulder or Wrist wrap. The Accessory Strap provides additional compression, which results in even faster and more effective relief from pain and swelling. You can target a specific area on your body that is especially painful or swollen. Attach the strap here and tighten for superior relief of pain and inflammation. All too often people find themselves re-injured sometime after their original injury, forcing them to start the healing process all over again from the beginning. This re-injury is caused by movement and strain of the injured area. If you restrict movement of the injured area, this will prevent the strain that leads to re-injury. Attach the Accessory Strap to your ColdCure® or BFST® Ankle, Elbow, Foot, Shoulder or Wrist wrap and target the area you want to immobilize. 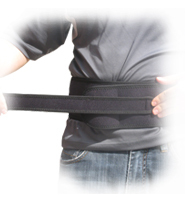 The Accessory Strap can provide a more customized fit for the BFST® and ColdCure® Back and Shoulder Wraps. The strap provides up to 11+ inches of extension, so you can use as much or as little extension as you need. We all come in different shapes and sizes and this strap will allow you to increase the size of your Back or Shoulder wrap to achieve the best possible fit and treatment. Back Wraps - Attach one end of the Accessory Strap to one of the Back wrap straps and pull it around your front. Attach the other end of the Accessory Strap to the other Back wrap strap. Adjust to the desired fit. Shoulder Wraps - Attach one end of the Accessory Strap to the long Shoulder wrap strap. Pull the other end of the Accessory Strap over to attach to the small tab of the Shoulder wrap. Adjust to the desired fit. The Accessory Strap can also be used to reduce any excess material preventing a perfect fit for the Small or Large Shoulder wraps. If the wrap seems big or bulky in a specific area, cinch or tighten the strap around the area for a more snug fit. King Brand® products come with a 1 Year Manufacturer's Product Quality Warranty. Please feel free to contact us any time if you have any questions regarding our products.